The T-Mobile MDA IV is simply the most advanced handset we have ever seen, combining powerful features that you'd normally find in a laptop and squeezing them into a PDA-style device that you can carry around easily. It's quite an amazing handset with a huge number of cool features. Firstly, there's the screen - the highest resolution screen we know of at 640x480 pixels (VGA resolution), and a good sized QWERTY keyboard. The screen on the MDA IV swivels round so that you can use the handset more like a traditional PDA if you like. And the MDA IV is incredibly well-connected. As well as tri-band GSM and GPRS, this is a 3G phone supporting high speed access to the Internet and multimedia services, plus it has wireless ethernet so that you can use it in a suitable hotspot, at home or in the office (if you have a wireless network). You can connect the T-Mobile MDA IV to a PC or accessory using Bluetooth or a USB cable. The MDA IV is more than an impressive bit of hardware though, it comes with the powerful, familiar and easy-to-use Windows Mobile operating system, along with Pocket versions of Outlook, Internet Explorer, Word and Excel to allow you to email people, track your appointments, surf the web and do some serious work. In addition, you can review PowerPoint files and Adobe Acrobat documents. There's a wide range of additional sofyware available for this platform, and you can store data on the MDA IV's removable memory cards. There are twin cameras on the MDA IV, allowing for video calling, stills photography and video capture. In addition, the MDA IV supports a very wide range of file types for great multimedia playback. Due out in in the summer of 2005. Please subscribe to our newsletter for updates. 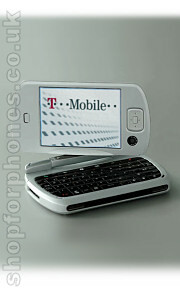 If you want more information on the T-Mobile MDA IV, subscribe to our mailing list. Also, the Update newsletter contains general news about new phone releases.